Who’d have thought a cappella would become trendy? Whether it was the resurgence of a cappella groups on college and university campuses or the surprisingly popular and entertaining movie Pitch Perfect, a cappella is finally getting its moment in the sun. For Pentatonix, it may seem like better late than never. Although the group of five from Texas has been around since they appeared on and won first place on NBC’s The Sing Off, they still aren’t exactly a household name. Their sophomore effort PTX, Vol. 2 may not completely change that, but it is likely to surprise a lot of people with how weirdly cool, well-done a cappella can be. It’s immediately clear that this isn’t your grandfather’s glee club kind of a cappella. 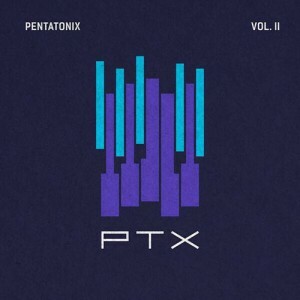 Instead, PTX, Vol.2 jumps into the contemporary end of the pool with a cover of Macklemore and Ryan Lewis’ “Can’t Hold Us.” It would be relatively easy to think the cover isn’t a cappella based on how incredible Pentatonix member Kevin Olusola is at beatboxing. His ability is astounding and is a large part of what makes this a cappella group so surprising. Without Olusola, the songs likely would not make the same impression. The cover is fun and high energy which makes it a perfect choice to start off things. While most of the covers on PTX, Vol. 2 are amazing, “Valentine” falls short, though that may not be Pentatonix fault. Although it’s well done, the song drags and unless listeners are really into ballad-y R & B songs, it just doesn’t have the same panache that most of the other tracks do. “Daft Punk” is a perfect example of a cover that really works. Not only does the song sound like it has all kinds of electronic layers when it really doesn’t, the group did an excellent job of seamlessly pulling together multiple Daft Punk songs. Without question, “Daft Punk” is a highlight of the collection. Although the album does have a handful of covers, this is the first time Pentatonix has included some original songs. “Natural Disaster” and “Hey Momma/Hit the Road Jack” are good and really showcase what Pentatonix can do with their voices. “Hey Momma/Hit the Road Jack” is an interesting juxtaposition between a contemporary song with elements of rap written by Olusola and the 1960s Percy Mayfield hit. It may sound weird, but it actually works, and quite well at that. “Natural Disaster” has moments where it sounds like there’s a gospel choir in the background but it fits with Scott Hoying’s main vocals and the insanely low bass lines by Avriel Kaplan. It’s difficult to say whether the current popularity of a cappella will run its course and then just fade into the background or if this is a genre that will really take off. Even if a cappella doesn’t become the next big thing, PTX, Vol. 2 is an amazing effort with some astonishing moments. PTX. Vol. 1 had original songs as well.